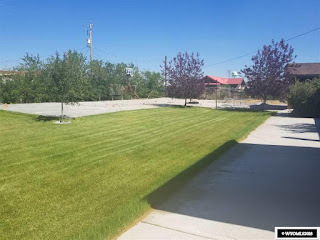 Large brick home with 4 bedrooms, 1.5 bathrooms, and a yard you will never want to leave, for sale in Marbleton, Wyoming. The home opens into a great entry and has an open floor plan from kitchen to front room. Down the hallway are the bedrooms and bathrooms with a large laundry room and storage. Lawn is fully landscaped with a sprinkler system and lots of extras. Backyard is fenced with trees and shrubs surrounding the property making the enclosure private. There is also concrete with a tennis and a volleyball set and basketball hoop. Great location, you have easy access to restaurants, churches and other services. Hit 189 and visit the Green River Valley Museum, West Meadow Canyon Creek, Muddy Creek or the Grand Teton National Forest. Contact Big Red Real Estate for your private showing today, 370-276-4900. Priced at $220,000.